The last time someone tried this, I had 600,000 page views after 10 years. Look to the left and you'll see the result of that fool's actions (Thomas J. Rosica, CSB). I look forward to the "excommunication" coming my way for defying the Bergoglian Fascist Regime. "Increasingly stringent policies." Yes, that is what Jorge Bergoglio would like, as long as he is the one in control of them. I believe Cardinal Burke, Father Weinandy, and Archbishop Vigano in hiding have all had little tastes of the "increasing stringency" already. They can't regulate rogue clergy good luck with that. Thanks for talking like a man Vox, it's refreshing. It's become absolutely delicious. Yes, we have to helplessly watch as these apostates destroy the church. We have a few responses we can deploy, give money, or not, attend, or not, support the good guys, CALL OUT THE BAD GUYS. And they think they can stop that!! Haha, no, no guys, this you cannot do. We are middle-aged Roman Catholics who have attended Holy Mass all our lives, given what we could, and done our best to stay faithful. At this point, we are almost ready to see excommunication as a badge of honor. We don't want to belong to your messed up Francis Church! We won't! We won't support it! And we will bad mouth you, and tell other Catholics about you, and discuss your apostasy and try to educate the ill-formed, until we're not here anymore, and there is not a single thing you can do about THAT, anymore than you can stop us from praying to the Good Lord Jesus to come save His Church and the faith from faithless destroyers like yourselves. You, will just have to buck up and endure us, as we have learned to endure YOU. Your efforts at control will FAIL. You will take the church down, it seems inevitable, but we will not go quietly. Every time there is a thorn? That's US. This sounds like something a "dictator pope" would want. How they are pushing "forward" hopping on any vehicle they can think of to help carry the agenda, like the vehicle of the yuuuts. This is simply abuse of their naivety and trust. Bergoglio likes to think of them as "agents of change", a concept identical to Mao's Red Guards. Eliminate your rigid parents - all for the good of the enlightened, liberated and unified collective. I know very well, coming from such a collective under communist regime in Poland, that INCREASINGLY stringent policies to keep moving "forward" are an absolute must - because truth and reality can never be overcome by a false narrative. Those Jesuits are so stupid! Truth does not evolve from point alpha, where god is stupid, to the point omega, where the stupid god, informed by Jesuits and sodomites, gets wise. Our engineers of the new order out of mess do their work via infiltration of a truth-based system, and training of the sheep in cognitive dissonance (with the help of demagoguery and addictive substances and activities, followed by threats and elimination, if those don't bring out the desired outcomes, of course). Truth just IS. It explodes their "new order" by just being. No infiltration and engineering process are required. Because this has always been the case, they have always used censorship, followed by gulags and murder. Burn the books, deplatform the bloggers, take control over education (home schooling must go) and media, fire from the job, bring out the lawyers, shame, mock, ridicule, confiscate property, deny service, send to a gulag, torture and murder - nothing will work, morons! Even if no rigid and deplorable is left standing, God knows you and your designs. The arrogance of the lowerarchy is beyond comprehension. A dictator Pope mandatorily needs the catholic media being muzzled and servilely obedient to the party line. A catholic version of the Pravda, the Tass agency or the Izvestia would be fine. Francis certified "catholic" websites will be seen as certified homo pervert friendly websites that mock Christ and His commandments. 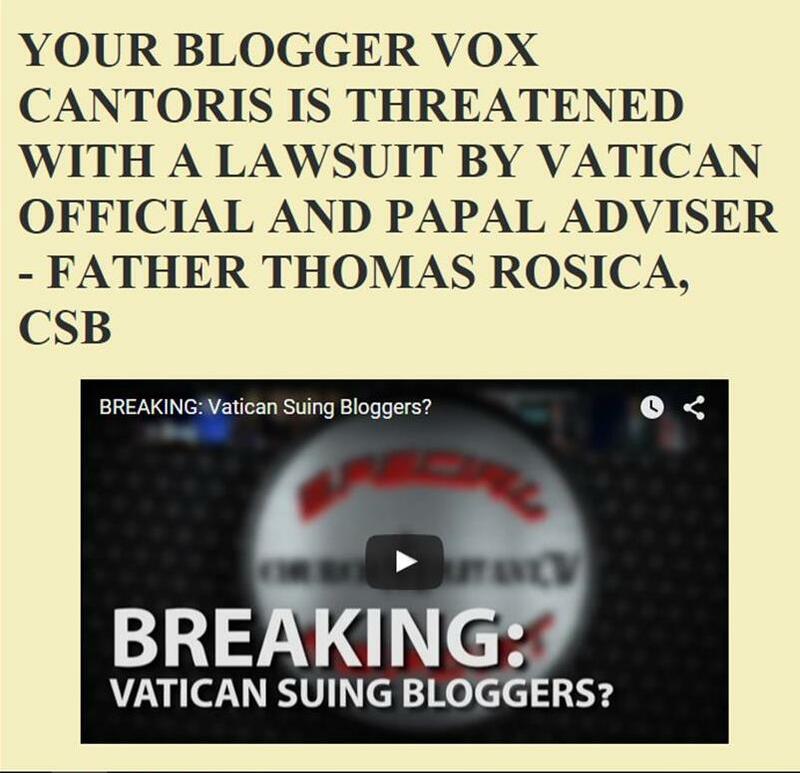 By voicing their arrogant,stupid idea of wanting to censor or prohibit the blogs that give true reports, it only shows Bergoglio's churchmen are afraid. The Vatican, The *NEW* China, its a deal! Boy Oh Boy they must have really cracked the S-its due to the backlash from faithful Cardinals, priests and laity who screamed out NO WAY will we allow you to use the demonic acronym lgbt in *any* final document.Thank you and God bless you Archbishop Viganò, through you the father almighty has slammed the breaks on Jorge Bergolio and his homo men. Jamie Martin must be feeling so emotional, "O" the tears, but hey, not to worry i am sure the devil will wipe them away whilst evil says, next time pretty boy, next time! Its not just the "official" church (as sspx now calls the modernists) censoring content. There are plenty of trad sites now doing the same exact thing. Louie shut down debate, Rorate did so, long ago, and the Remnant is notorious for "detecting as spam" comments that challenge their position du jour. Maybe they could use a rating system based on the 5-Star model...but instead of stars how about 5-Stangs? If we had a Pope, I would love certified Catholic websites. I would never read a Catholic book that didn’t have an imprimatur. This would be perfectly natural and good if we had a Pope. The problem is Jorge isn’t Catholic so he can’t certify anything for us. I couldn't help but laugh out loud at the Catholic fake news site comment. Considering all the fake PR that has and will continue to come out of the Vatican, it's like the pot calling the kettle black. I guess PF hasn't heard that old saying about cleaning up your own house before criticizing others? Anything they'll certify as Catholic I'll know is not too Catholic. Kathleen.....love to read your posts....a woman after my own heart. Indeed we will be a constant thorn in their side, and by now praise God there are LOTS of us. 'Excommunicate' us? Right.....from their filthy anti Church? Whooo hoo!!! St. Athanasius is so very relevant to us at this point in Church history! "They have the buildings, but WE HAVE THE FAITH!!!" Looks to me like we're on our way 'underground' people! St. Athanasius, PRAY FOR US!!! p.s. Let them plan and scheme.....they have so much more to worry about at this point than 'fake news' and 'faithful websites'.... The Feds are breathing down their necks as we speak. Louis shut down comments because he was getting too many nutters. The "nutters " were fighting against each other and there were attacks against certain posters and guest authors who posted the Truth along with documentation to prove what they posted was the truth. ALL communist tactics against Louie's site and now proven to be coming from the Vatican. Censorship is definitely a communist tactic. Opus Dei has a list of Forbidden Books for their adherents. 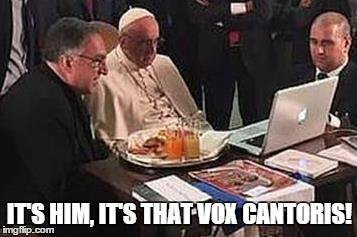 Now the Vatican wants to censor websites. & we are still waiting for him to do his duty before Christ & answer the Dubia & +Viganò's Testimony. A true pope would have publicly & properly responded quickly but all PF can do is to throw stones & call for pre-decided synods to distract our attention (he hopes). I think it’s time to be serious in our discussions now. It is not helpful to talk about, “nutters.” I want error to be addressed and called out explicitly. There is something going very wrong here and it seems unprecedented. Crying “Nutters,” is a path to shutting down discussion, it does not reveal any truth nor condemn any error. We are looking at an apocalyptically serious situation; I’ve got kids, let’s stop with juvenile name calling and try to clarify what Catholics need to do to attain eternal salvation and avoid the fiery pits of hell, please. I’m not sending my kids out following Bergoglio into hell so that’s a problem when he’s claiming to be the Pope of the Catholic Church. Good post, Vox! I've shared it on 'Musings'. Now, as to Melanie's comment. It's impossible to have a 'nihil obstat' and 'imprimatur' for a website. Say that Vox or I apply for them for our blog. As soon as it's granted, 'we go into 'edit' and change what we wrote. It would take massive technology or a massive bureaucracy reading websites constantly to be effective. None of which the idiots at the Synod thought about. I would not be surprised if there was some sort of coordinated effort to overload Louie's combox to the point he felt it necessary to turn off comments. I could see how it could require a significant amouny of time to moderate these comboxes to keep the nutters at bay. Thank you Vox for that commitment. The irony here is that if Bergolio and the V2 cabal were actually teaching the Catholic Faith as taught from the beginning, they would have the moral duty to censor and shut down all websites that deviated from orthodoxy. Guys, with all the shut-downs occurring on social media and also by big tech companies - I strongly suspect that this Synod's conclusions such as #146 were part of a greater coordination strategy conducted hand in hand with Soros and the Deep State in Washington. The Vatican is pretty much verbatim taking their strategy as naked as a jaybird from the leftist lunatics. Even LifeSiteNews is getting threatened with a take-down by their host. We'll need to start shifting to alternates en masse. Considering Google owns Blogger, it'll only be a matter of time. I do not think the average Catholic understands that the Opus Dei cult has been purchasing catholic media outlets for a very long time. 'Opus Dei Watch' has been keeping track. Oh look, someone's comment about the American bishops says "kill them" (caedite eos). Quick, change teaching on death penalty.